Hoping you all are having a warm and wonderful week. Today's post is showcasing my everlasting love for fringe. I mean how fun and spectacular is this skirt? It's the perfect head turner/statement piece. It is a faux suede material and pretty soft to the touch. I love that it moves with every stride(not stiff and cheap, as some of the other skirts I've seen similar to this style). 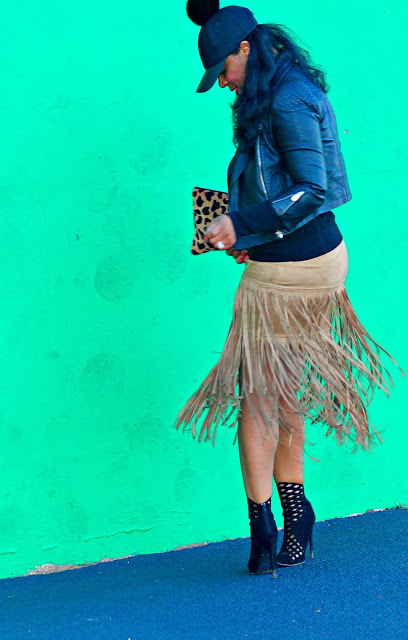 I went for an edgy/urban/chic vibe when styling this fringed skirt. I paired it with a sleek black turtleneck to elongate and slim my torso and also to balance the proportions. I added the moto jacket for a little edge, as well as my booties(which I can't seem to get enough of these days). This cute little pom pom hat was the perfect accessory to top the look offand incorporate a little fun twist. The leopard clutch brought everything together and provided some texture, pattern, and interest to the overall look.